New Delhi: Over 100 beneficiaries of the Pradhan Mantri Ujjwala Yojana, today interacted with Prime Minister Narendra Modi, at his residence. The female beneficiaries, who belong to various States across the country, are in New Delhi for the LPG Panchayat, which was hosted by President Ram Nath Kovind at Rashtrapati Bhawan earlier today. 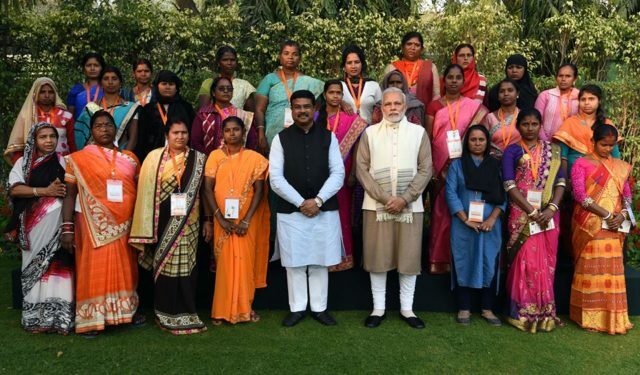 During the informal interaction with Shri Narendra Modi, the beneficiaries explained how their lives had improved through the use of LPG cylinders. The Prime Minister encouraged them to talk on various aspects of their day-to-day life. In response to their observations, the Prime Minister mentioned the Saubhagya Yojana, which has been launched by the Union Government to provide electricity connections to every home. He also emphasized the need to end all forms of discrimination against the girl child. He exhorted the gathering to work towards ensuring cleanliness in their villages. He said this would improve the health of the entire village, much the same way as the Ujjwala Yojana had improved the health of their family members. Praising and thanking the Prime Minister for the Ujjwala Yojana, some of the beneficiaries also took the opportunity to discuss other specific development challenges in their respective areas. Union Minister for Petroleum and Natural Gas, Shri Dharmendra Pradhan was present on the occasion.